ST_MinimumBoundingCircle — Returns the smallest circle polygon that can fully contain a geometry. Default uses 48 segments per quarter circle. 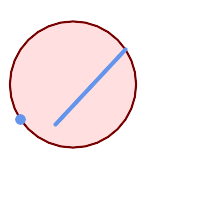 Returns the smallest circle polygon that can fully contain a geometry. The circle is approximated by a polygon with a default of 48 segments per quarter circle. Because the polygon is an approximation of the minimum bounding circle, some points in the input geometry may not be contained within the polygon. The approximation can be improved by increasing the number of segments, with little performance penalty. For applications where a polygonal approximation is not suitable, ST_MinimumBoundingRadius may be used. It is often used with MULTI and Geometry Collections. Although it is not an aggregate - you can use it in conjunction with ST_Collect to get the minimum bounding circle of a set of geometries. ST_MinimumBoundingCircle(ST_Collect(somepointfield)). The ratio of the area of a polygon divided by the area of its Minimum Bounding Circle is often referred to as the Roeck test. Performed by the GEOS module.